Tonight we’re eating a “non-velveeta and rotel” queso, in response to a reader’s request. 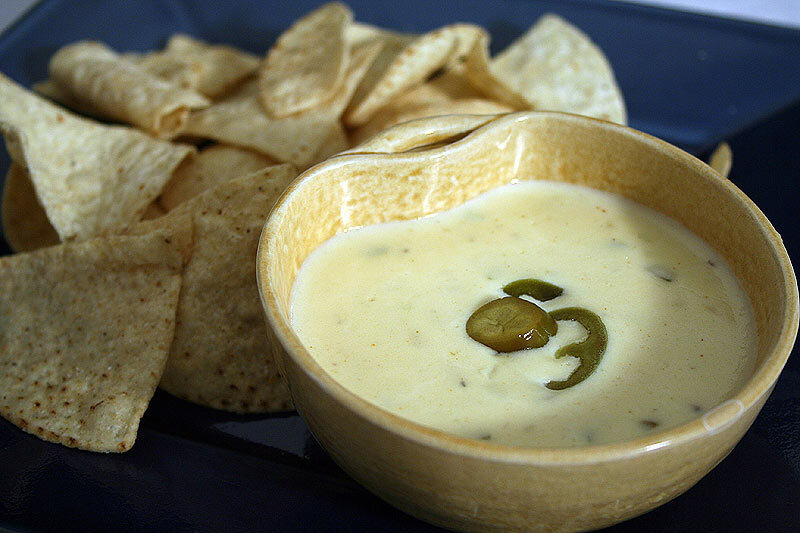 The queso was made with cheddar, monteray jack, jalapenos, and the secret ingredient – a splash of beer. The queso was served with tortilla chips. T: it was indeed righteous, it has been named properly. A: And I thought it was just funny. T: how’d you like it? A: I dug it. It’s nice to finally post a recipe rather than just tell people to email us for recipes (they never do). T: yeah, it feels nice to give to the community. btw, this recipe was requested by Regan in the comment section of the previous post! A: Ask and you shall receive. T: Mom, what did you say about the queso earlier? L: I said it was the best cheese dip I’ve ever had. L: and i’m not using them lightly. T: there you have it, folks. Yeah, it’s good. I give it a 4.4/5. I don’t really know why i give it that, it definately earned that… it could have possibly been higher, but i’ll stick with that rating. A: I give it a 3.873/5. It was good, but there’s definately room for improvement. It was Queso 1.0. A: so there you have it! All you have to do is ask, and we’ll see about coming up with recipes to fulfull your deepest desires! T: word, homes. ask for more recipes it’s fun!!!! A: dude, we still gotta eat dinner, man… yummy leftover thai. mmm mmm mmm. There’s a groovy little place called Spice and Rice that absolutely rocks. Some of the best Thai food I’ve ever eaten. T: yeah, really good. cool, later peeps. First dice onion, mince garlic, and chop jalapenos. Place one mid-sized sauce-pan on the stove for later and one small sauce-pan on a burner over low to medium-low heat. Add 1 tbls oil to the small sauce-pan, preheat, then add onion. SautÃ© until onion is translucent, do not caramelize. Add garlic to sauce-pan with onions, sautÃ© for a minute or until garlic has softened. Add milk, heavy cream and beer to the onions and garlic and raise the heat to medium. Stir frequently until just under boiling. Do not allow it to come to a boil. Next, turn mid-sized sauce pan on, to a medium heat. Make a roux by: adding 1 tbsp of butter to sauce-pan, allow to melt but do not allow the butter to brown. Add one tbsp of flour to the melted butter and stir frequently for 30 seconds to a minute, just to cook the flour. You do not want the roux to take on any color. Slowly add small amounts of the hot milk to the roux, stirring until smooth each time to prevent clumping. Once the milk has completely been added to the roux, add 2 tbsp jalapeno juice, and chopped jalapenos, cumin, and cayenne, stir to combine. Stir frequently until the milk is nearly up to a boil, then remove from heat and add monteray jack and cheddar. Stir, then taste. Adjust flavor as necessary with salt, pepper, and more cheese if you desire. Serve warm with tortilla chips. Garnish with jalapenos or cilantro. This sounds so good! I hate processed cheese dips but I know I would love this! I totally agree, cheese shouldn’t be able to stay at room temperature for years with out going bad (like velveeta). Down with processed cheese dips!!! Hello Amanda, I just found your site and love your recipes! I have an online store for people with food allergies and intolerances. I try to offer additional resources to them and one is to showcase cookbook authors/bloggers. I will post a recipe with full credits and links back to your website. Also, I put in press releases and social media mentions as well. I would like to share one of your favorites. I look forward to hearing from you.